So you’ve got you hands on the new The Island of Blood boxed set for Warhammer and you’re keen to get your miniatures on the tabletop and ready for battle. This painting guide can be used for many of the elves from the Island of Blood set and following it will give you a High Elves army painted to a good gaming standard. Remove Mould Lines and wash the model, this may sound stupid but I have painted lots of metal models (and a few plastic kits) which need to have baths and a good scrub before painting, so I feel it is just good practise to do it for all models. Uniform Grey Spray (the Army Painter) – I love the Army Painter Sprays as they give good even coverage and dry as it hits the model. Cloth – Painted with many Layers or Watered Down Skull White, aim for a milk-like look and consistensy, keep the recesses dark. 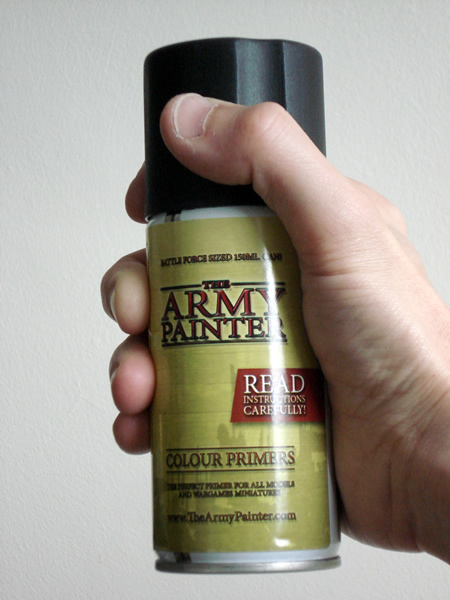 Armour – Paint with Chainmail. Hair (and other blue bits :D) – Paint Regal Blue but kept the dark colours in the gaps for the hair. Wash – All but white areas were washed with Badab Black. 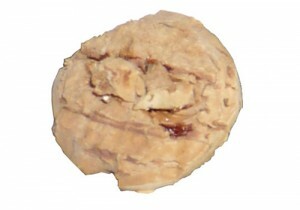 Cloth – Apply more White less diluted than in the previous stage but still quite watery. 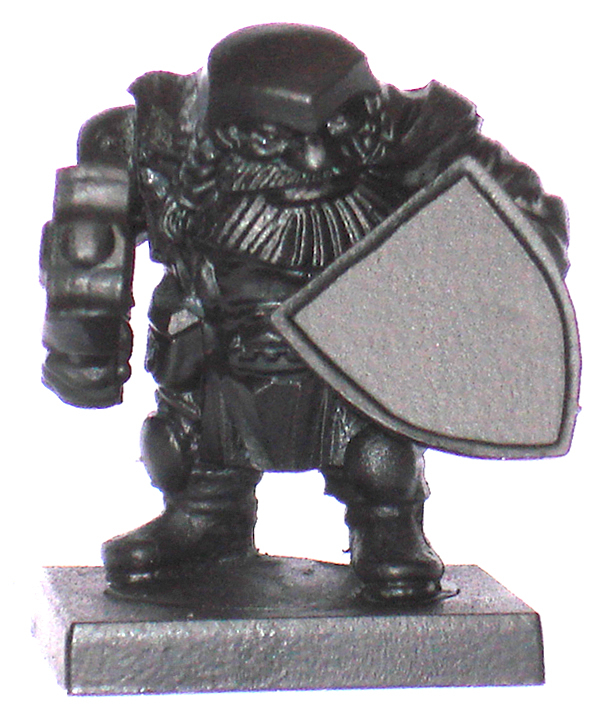 Armour – Dry brushed with Mithril Silver Dry , alternatively just apply to each individual Armour plate. Gems – Highlight with Blood Red then Blazing Orange on top. Sword – Highlight with Mithril Silver. Hair – Highlight with Enchanted Blue. then wash the face with Ogryn Flesh. Sword – Wash with Gryphonne Speia to give it some more tone. Finally, neaten up areas detail where needed. I believe that is all that I really need to say except that it was great fun to paint. Games Workshop’s daemons models are usable in a number of different armies over the two main games systems. Unfortunately the bases used differ between these systems meaning that ordinarily you need to buy a complete set of models for each system. I have come up with a way of using cheap magnets, purchased from eBay, to base the plastic daemon models, I hope that you find this guide useful either to copy the techniques or as a basis for your own techniques. If you have any other tips to share please let us know your thoughts. *Or something similarly small and weighty that does not attract magnets to glue to the underside of the bases. You may need a responsible adult to help with this stage. You will use roughly one wine cork per 5 bases, so for a squad of 10 models, drink two bottles of wine. 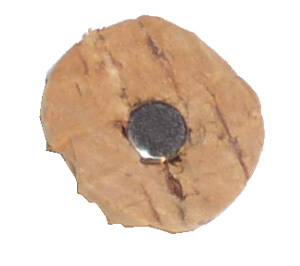 Once you have sobered up, saw the bases across the cork to make circular sections, these should ideally be about 5 to 10 mm thicker than the magnets. Step 3. Distress the edges of the cork sections with the clippers. 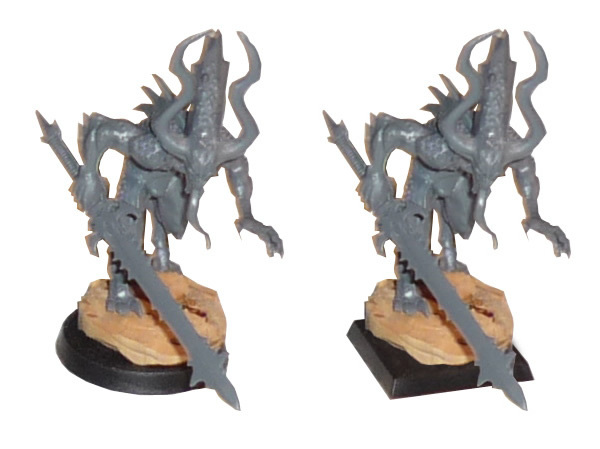 You may want to have your daemon legs to hand to make sure that you can pose them in a satisfactory manner. Step 4. Hollow out a pocket on the underside of the cork sections, wide and deep enough for the magnets to fit into. Use the superglue to glue the magnets into place. Step 5. 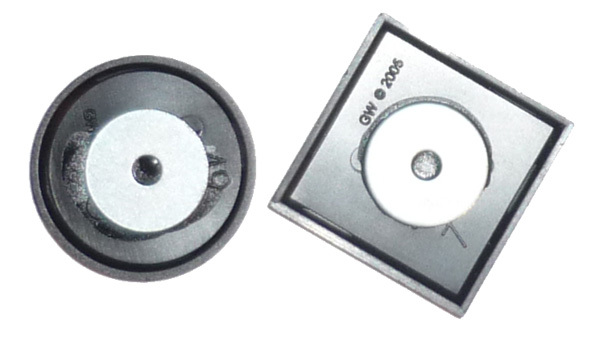 Glue the washer to the centre of the underside of the plastic bases using superglue, then also glue those bits of junk metal as well. This extra weight is to make sure that the bases don’t repel each other when you are trying to rank them up. Step 6. Drill and pin the feet to be attached. I used paperclips for the pins as it is a bit thinner than brass rod. Make the pins long enough to go right through the cork; then trim them down to the correct size. 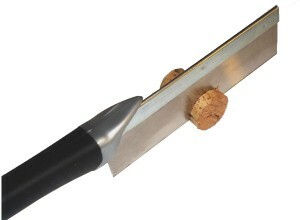 And that’s about it, the cork will now stick magnetically to the base of your choice. If you want you can glue them together now, though I prefer to paint the model and base separately and then glue the two components together afterwards using superglue. A wet coat of codex grey, leaving some black showing. A heavy drybrush of fortress grey. Highlight the edges with skull white. I used wine corks as they fit perfectly on 25mm bases (and I have a plentiful supply of this material). Other materials that would also work include cut up bits of plastic sprue or small pieces of chip board. If you have any ideas for basing, we’d be happy to hear your suggestions. The KR Multicase, by Kaiser Rushforth, is a range of figure cases that include everything from cases for small skirmish games to huge aluminium/re-enforced polyester cases that can hold up to 640 miniatures. In this review we are mainly looking at 2 products, the KaiserOne (and by extension also the KaiserTwo & KaiserFour high capacity cases) and what could be considered Kaiser Rushforth’s core product the Card KR Multicase. 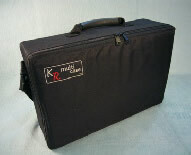 The KR Multicase makes organising your miniatures easy by separating transport from storage. Storage is mainly handled by the Card KR Multicase, a gamer can store each army they own in a separate Card KR Multicase. When they need to head off for a game, they simply pick the Card KR Multicase that contains the army they wish to use and put it inside the KaiserOne polyester carry case (More card cases can be transported if using the KaiserTwo or KaiserFour). This means less fiddling about, loading and unloading individual trays. The Card KR Multicase is also flat meaning that it stacks or sits on shelving very nicely. The way storage and transport has been made so easy is probably the most impressive thing about the range, the people at KR have taken some pretty unconventional ideas (I fought hard against the temptation to say “they thought outside of the box”), and have made a product that just works. The KR Multicase uses a different tray/insert format than most cases, their trays are longer but narrow than Games Workshops’ foam trays. Playing around with tray layout and thinkness has also allowed Kaiser Rushforth to fit up to 40 models per tray and up to 4 trays in a case compared to Games Workshops similarly sized case which holds 108 miniatures. Additionally the KR trays come in 4 differently laid out types. Two infantry trays, one holding 40 miniatures the other 36, and two vehicle/monster “Pick&Pluck” trays that can be adapted to hold large or oddly shaped miniatures, all come in 5 different depths, 23mm, 32mm, 51mm, 70mm & 110mm. Add to this half size trays that sit side by side in a single layer and you’ve got an incredibly flexible system. Finally the foam used in the KR range is slightly less dense than most of it’s competitors, this foam means less wear and tear on your lovingly painted miniatures. The basic Card KR Multicase retails at just £21.99, that’s significantly less than similar Citadel & Feldherr offerings, the Card KR also carries more miniatures. At £38.99 the KaiserOne is slighly more expensive than these other cases (at £35 & £32) but you get a card case and separate waterproof outer and it still has about 50% extra potential storage capacity. As far as I’m concerned this represents good value for money, especially when you factor in that you only need to buy one KaiserOne and then just keep adding card cases to your collection, this modular aspect doesn’t form part of other case ranges. But it’s made out of card! Now, a lot of people will be concerned by the fact that the core storage component of this range is made out of cardboard, even if it is tough dense card. Well we’ve done a couple of tests that show that this really shouldn’t be a problem. The case survived with minimal damage, just scuffed on a couple of corners, also most importantly it stayed closed. I’m not so sure that a hard case with catches would have stayed closed as I imagine there is a risk that the shock would pop them open. Also the impact absorbency of the KR card case means that less risk of the case splitting open completely. This is less of a test of something that could happen in the real world and more of a demonstration of the general strength of the card the case is made from. I’m not the heaviest chap on the planet, far from it, but that is still a substantial load for a card case. This is a test of the polyester KaiserOne to see if it can properly protect the Card KR Multicase. Hosing a case down for 30 seconds must be equivalent to at least 5-10 mins worth of rainfall that most wargamers would be willing to endure before they sought shelter. The KaiserOne passed with flying colours, pretty much the only dampness on the card case were my fingerprints from opening the soaking wet outer case. A second test was also undertaken (but not recorded as it would be as interesting as watching paint dry) where we left the case 5 minutes before opening, the card case was equally dry. 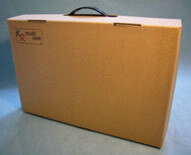 The KR Multicase range takes a novel approach to miniatures transport and storage. I have to say that I will be toting a KR around in future, the KaiserOne is a stylish looking case and the card inner case makes storage easy. After a whole day using (and abusing) the KR I’m hooked. 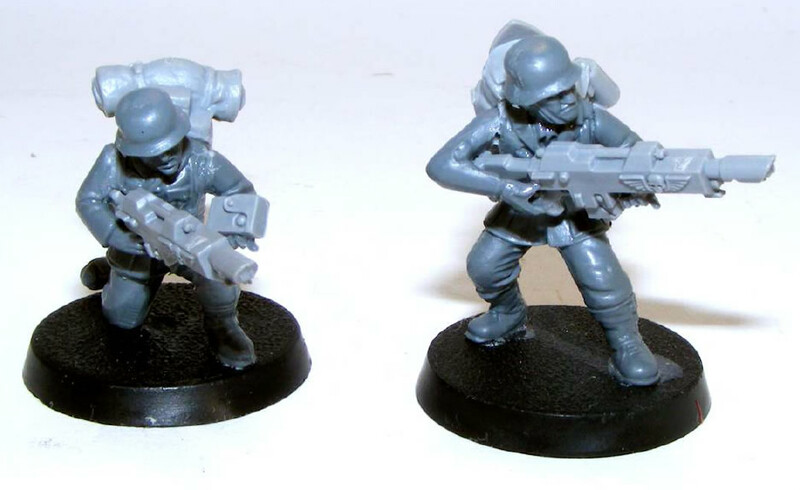 Mantic Games’ miniatures are affordable and quick to build, making putting a fantasy army together easy. 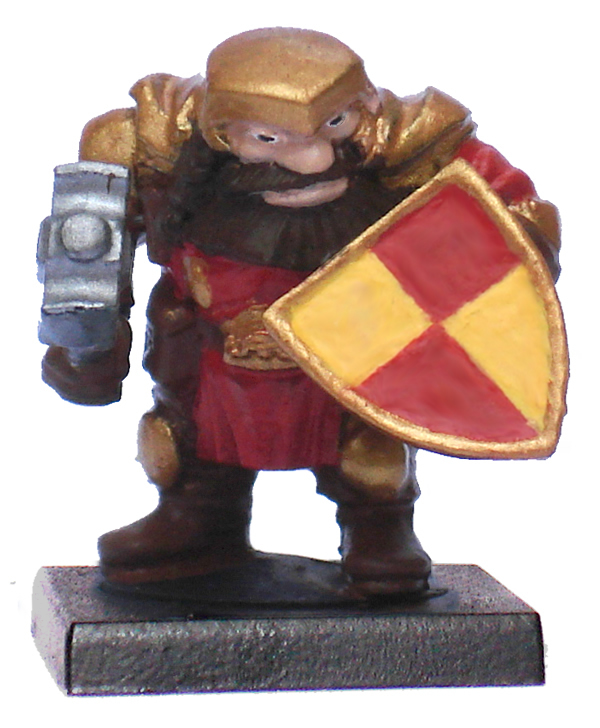 Once you’ve built your units you’ll want to get them painted and ready for the tabletop so Big Orbit games has put together an easy painting guide for Mantic’s new range of Dwarfs. 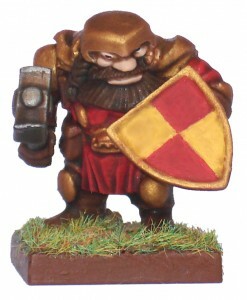 This guide will demonstrate how to get your rank and file Dwarfs ready for battle in 5 easy steps, most of which just take a minute or two and involve minimal painting skill. This guide is also suitable for painting characters but you may wish to add extra detail during the basecoating stage. Easy one this, using the matt black undercoat spray from the paint set, apply a even undercoat using sweeping motions across the model or models. Note: Remember to shake the can for at least a minute. 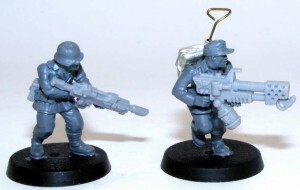 Using the paints in the Army Painter Paint Set, paint the model using flat colours, i.e. using no shading or highlights. 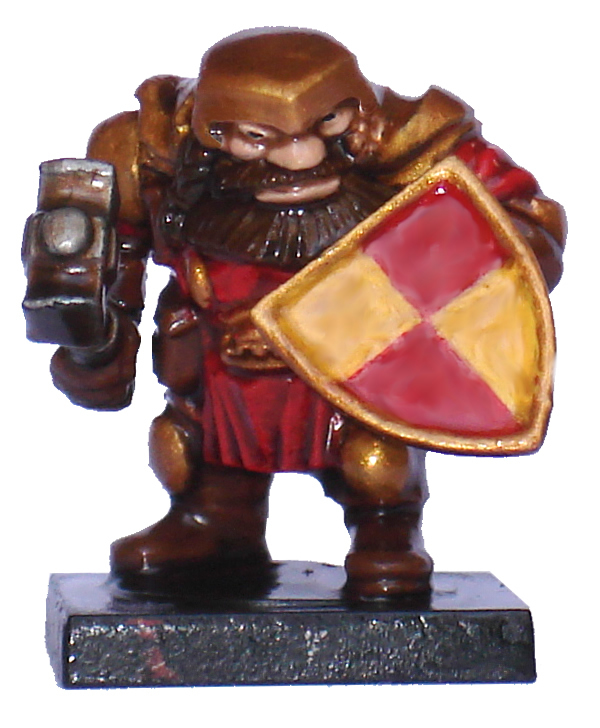 For our dwarf we used gold for the armour, silver for the hammer and chain mail, red for the cloth, brown for the leather, flesh for the face and finally brown, darkened with a small amount of black, for the beard to make it make it stand out more. The only real detail that was added was the eyes (not terribly well however as they are not my forte). We are using “Strong Tone” Quickshade dip on our dwarf, “Soft Tone” & “Dark Tone” are also available, strong is the medium tone dip. To base our dwarf we first painted the base brown and then added some sand to the base using super glue. We finished off by applying PVA to those areas of the base not covered in sand and giving the base a dip in a tub of static grass. 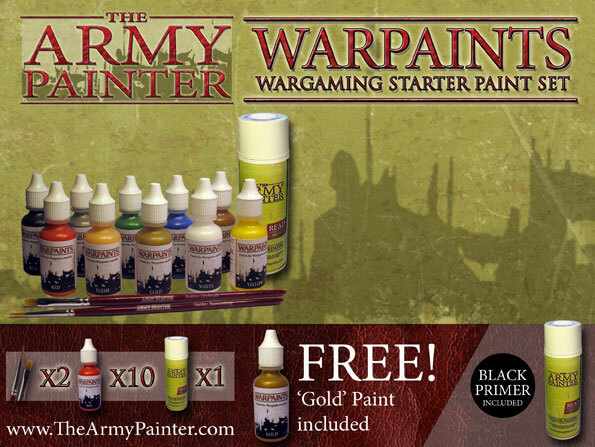 The Army Painter has just released two new starter paint sets, each set contains a can of spray primer, 10 bottles of paint and 2 brushes. The 2 new boxed sets differ in the colour of the spray primer that is included, one comes with a can of white and the other with black, we are reviewing the black version here. The first thing that you will notice is that these paint sets represent great value for money retailing at just £22.50, to get an idea of what you get for your money we have broken things down a little here. The spray can is only 150ml but a 400ml can costs £6.99 so we’ve got £2.62 worth here and the 2 brushes would have an RRP of £5.50 if sold separately. The Army painter don’t sell their paints individually at the moment but Games Workshops paints retail at £2.25 each, so 10 paints would be worth £22.50 at this measure, this is not taking into account the fact that each bottle of The Army Painter paints contains 20% more paint than the Games Workshop pots. Based on these assumptions we’ve got £30.62 worth of product here, retailing at just £22.50, it is of course even cheaper at Big Orbit games. The first thing we tested was the primer, this is the usual high quality primer we have come to expect from The Army Painter, it has good coverage and dries very quickly. Out of this little can we undercoated 1 Vehicle, 5 Heavy Cavalry, 5 Monsterous Creatures & 10 Infantry, we then we ran out of models to undercoat but there was still a small amount paint left at the bottom of the can. We mentioned that the primer dried quickly, it’s so fast you can actually watch it dry in front of your eyes. Now watching paint dry isn’t the most exciting of pastimes but at least with The Army Painter you’ll only be doing this for about 1 minute even if you’re a bit heavy on the primer. As for the paints themselves, they appear to have good consistency, with no lumps, it is quite thin (similar to Games Workshops Foundation Paints) which means paints can easily be used straight out of the bottle. Coverage seems good so pigment load may be high, another similarity to Games Workshops Foundation Paints. Sound’s good, what’s the catch? When looking through the different paints in this set we did have concerns about the tones/shades of some of the colours included, particularly the red which seemed a little washed out. We applied a few of the paints to the base of a vehicle and it seems that the red isn’t so washed out after all, below it is compared to citadels blood red, that said the yellow doesn’t fair quite so well. This is a potential issue as a colour can be toned down through mixing but richer colours can’t be created this way. …and that is that The Army Painter are not yet selling their paints individually (hopefully this will change in time). This means that if you run out of a colour you cannot replace it without buying a whole new paint set. This is a big issue and might put off hobbyists that do a lot of painting and may well limit the appeal of this set. All in all these are quality paints that represent good value for money but without being able to replace paints on an individual basis it doesn’t represent a practical solution for anyone that is concerned with obtaining consistent colour across a large number of models. That said these sets provides everything the beginner needs and could represent a good introduction to wargames miniatures painting. Also, those that are less concerned with the painting aspect of wargaming and just want to get miniatures onto the tabletop as quickly and cheaply as possible may find these sets of interest. As I write this the rolex replica popular Games Workshop Paint Set is unavailable and there is no news of a replacement. The lack of a basic beginners paint set from Games Workshop has made getting started with Warhammer, Warhammer 40,000 or Lord of the Rings just that little bit trickier… Luckily Mantic Games have just released a little beauty. The Mantic Paint Set represents astounding value for money… 9 paints, a brush and 6 models for an RRP of just £17.95. Ignoring the models (not that you would as they are very nice indeed) and assuming the brush is worth maybe £2.95, this would give us an RRP of £15 for the paints alone, that is just £1.66 each. Games Workshops paints retail at £2.25 and each pot contains 20% less paint than the Mantic bottles. An absolute bargain, especially when you factor in Big Orbit games additional discount!